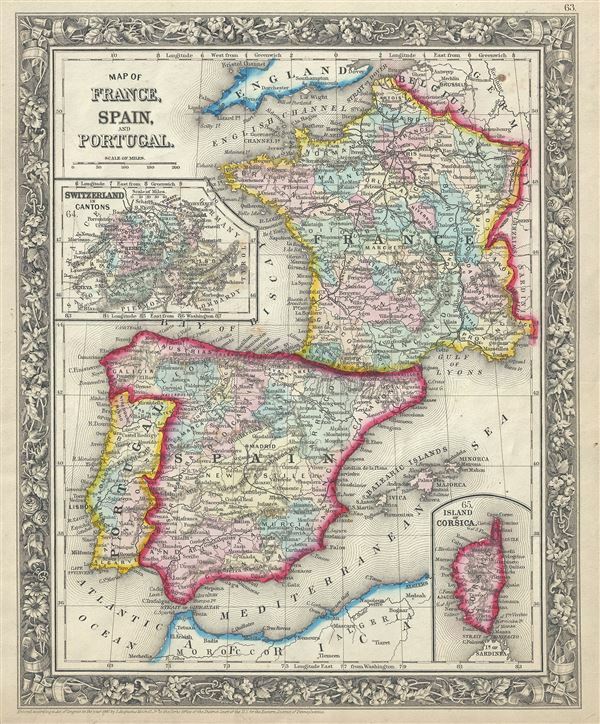 This is a beautiful example of American map publisher Samuel Augustus Mitchell Jr.'s 1860 map of France, Spain and Portugal, as well as the Balearic Islands of Ibiza, Majorca, and Minorca. . An inset in the upper left quadrant focuses on Switzerland. Another inset map in the lower right quadrant depicts the Island of Corsica. This map also identifies various cities, towns, rivers and an assortment of additional topographical details. Mitchell Jr., S. A., Mitchell's New General Atlas, Containing Maps Of The Various Countries Of The World, Plans Of Cities, Etc. Embraced In Forty-Seven Quarto Maps, Forming A Series Of Seventy-Six Maps And Plans, Together With Valuable Statistical Tables, 1860 edition. Rumsey 0565.034. Phillips (Atlases) 831. New York Public Library, Map Division, 1510829.